Trump’s latest move against Iran is not good for anyone—WHY? They’re totally lying about the 5G roll-out! Is the U.S. determined to start World War III in the Mideast? In what other country does a high school kid “armed with a shotgun and a .38 revolver smuggled under his coat” show up at 7:30 AM to conduct a well-planned mass shooting? How did he even hide a shotgun like that?! Answer: These government-sponsored acts of domestic terrorism, carried out under the rubric of Operation Gladio, only occur in a nation targeted for draconian gun control measures like the United States of America. They only take place in a society that poses a formidable obstacle to a New World Order agenda determined to disarm every person on the planet. 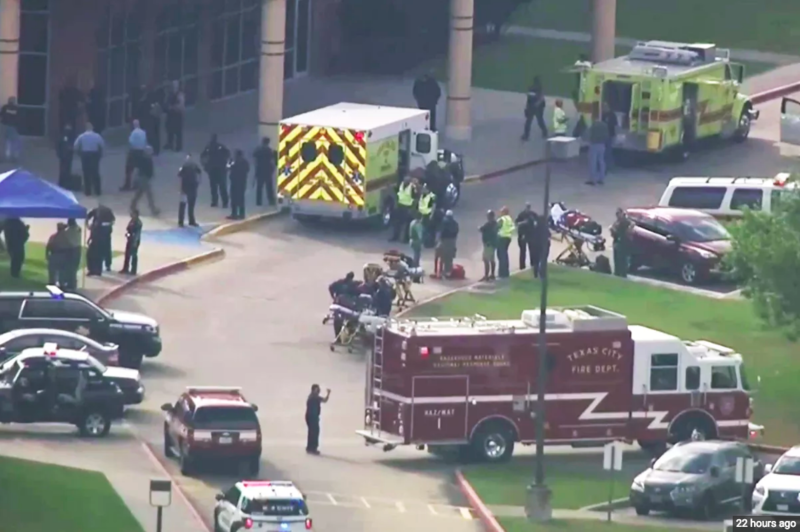 This naked terrorist attack in Santa Fe also begs the question, as every school shooting does: Why America? Why do these mass casualty incidents only take place in “the land of the free and the home of the brave”? Why do they rarely occur in other Western nations? The reason ought to be self-evident by now: The USA is the Military Arm of the New World Order. It’s imperative that every U.S. citizen understands the real purpose of Operation Gladio C. It concerns an ultra-secret blueprint for triggering gun control legislation that is being implemented by a covert NATO-directed organization throughout the fifty states. Every school — elementary, high school and college (esp. large universities) — is a potential target of this ongoing clandestine military operation. Each mass shooting is executed as a false flag black operation so that the true perpetrators can elude detection, which they always do. Because the state of Texas presents the single greatest threat to their surreptitious plan of citizen disarmament. The irrefutable historical record clearly indicates that a highly disproportionate number of domestic terror events have been conducted in Texas since 1966. A careful accounting of every terrorist operation since the purposefully disastrous Waco Siege of 1993 reflects the reality that Texas has been under constant attack. It’s entirely true: the NWO globalists are absolutely determined to take down the unusually independent and Lone Star State of Texas. The perpetrators know that Texas is the lynchpin in their scheme to rifle through the remaining 49 states and territories stripping gun rights from every resident, except the illegal aliens of course. Why is that? Just who are many of these “UN-sponsored” illegal immigrants, and what is their real intention by coming to America unlawfully? It ought to be apparent that the Texas-Mexican border is a very long and porous one. The opportunities, therefore, are countless for drug cartels and terrorist groups alike to slip their members across the practically open border. Only with this critical knowledge will the true size and scope of the Deep State conspiracy be properly understood. Texas is ground zero in the furtive scheme to undermine the sovereignty of the American Republic. So is California, but under globalist Governor Jerry Brown they already follow every single order issued from the NWO administrative headquarters in City of London. The specific location of every false flag school mass shooting is chosen by purposeful design. Santa Fe, Texas is located 30 miles southeast of Houston. It sits between Galveston and Houston, right in the middle of a RED county. These school massacres are always carried out either in a highly conservative locale like Santa Fe, or in the middle of a BLUE county like the Parkland shooting in Broward County, FL . In both cases, the calculated plan is to incite an extremely strong reaction against gun ownership. Who, after all, wants to see the school children repeatedly slaughtered? In view of this well-established Operation Gladio strategy, the globalists will not relent in carrying out these false flag shootings. They will target the schools until there is a sufficient groundswell of support to abolish the Second Amendment. This is just one reason why Santa Fe was selected; Deep State is especially targeting schools within the jurisdictions dominated by gun-owning patriots such as those throughout Texas. Let’s not forget that many of these conservative Christian communities have a very strong religious orientation. They are populated by folks whose faith in Jesus Christ runs very deep as their biblical beliefs are unshakable. Hence, they present a particularly threatening posture to the exceedingly degenerate and fundamentally anti-Christian globalist agenda. The Spanish name Santa Fe translates to “Holy Faith”. Therefore, it should be quite clear that the NWO terrorists are intentionally challenging the faith of the faithful. The folks in Texas are being tested right in their schools, in their churches, and in their businesses. What follows is a short list of the most recent false flag attacks throughout Texas since President Trump took office. Texas Church Massacre: Who really did it and why? ‘ISIS’ Terror Attack in Garland, Texas Abetted by FBI! Just as Garland, Texas is a bedroom community of Dallas, and the Austin bombings took place throughout that city and outlying areas, and the Sutherland Springs church shooting was conducted 30 miles east of San Antonio, each of these terror operations has both a local and global agenda. This shooting outside of Houston is certainly no different. Because the Texas government had been such a staunch opponent of Obama’s extremely depraved LGBT initiatives, Christian stalwarts throughout the state have been persistently terrorized. Operation Gladio C black ops are being utilized with extraordinary premeditation to victimize any group or organization that attempts to thwart Deep State’s dark agenda. In point of fact, patriots and nationalists, Christians and conservatives, Libertarians and 2nd Amendment advocates, Republicans and Independents have been the object of so many false flags (e.g. Las Vegas massacre hoax) conducted around the country. While Texas is the primary prey of the predatory globalist cabal, these godless perps are determined to undermine the bastions of Christianity however they can. It’s also instructive to revisit the last major school shooting in Parkland, Florida–another aggressively targeted state by the globalists. Not only was that mass casualty event carried out on Saint Valentine’s Day, it was also Ash Wednesday. Hence, the deliberate tarnishing of two religious holidays was accomplished through the cynical implementation of one savage false flag operation. The greater Houston-Galveston metro area is also well known in the underworld as a major hub for many illicit activities. It is the site of several major and highly organized criminal operations that include human trafficking, arms trafficking, and drug trafficking (See the CIA map below with the many vectors of dissemination of drug trafficking to and out of Texas). The crucial point here is that many of these barbaric acts of terrorism are often used to send a strong message to those who are deterrents to such institutionalized criminal activity. Just as the Sandy Hook massacre was used to issue a very serious warning to the many high-level Corporate America parents whose children attended school in that extremely wealthy county — Fairfield County, CT — Santa Fe was utilized in a similar manner. Only the message for conservative parents is completely different than the one for liberal ones. It’s important to point out that Houston has also been targeted by the geoengineers who are in the employ of the globalist cabal. While the state has been the site of several geoengineered and catastrophic weather events, each of which was fabricated to wreak havoc statewide, Houston has been specifically singled out for unparalleled devastation. Superstorm Hurricane Harvey is only one of many manmade meteorological calamities to have hit the city with awesome effect. Hurricane Harvey: A Geoengineered Superstorm Targets Texas—WHY? Really, why is it that virtually all of these angry white teenagers, who are set up as mass shooting patsies, share the exact same profiles. They are, at once, (i) on heavy-duty psychotropic medications or other psychoactive drugs, (ii) they have a long history of playing exceedingly violent video games, (iii) they have quick and easy access to AR-15 assault rifles, shotguns, revolvers and bomb-making materials, (iv) they come from terribly broken homes spending a significant portion of their life not under the direct supervision of their biological parents, (v) and they are under the prescribed care of a psychiatrist, clinical psychologist, psychotherapist, MSW, or specialized school counselor for their extreme antisocial and/or violent tendencies. Exactly who do these psychiatrists and psychological counselors really work for—the C.I.A. MkUltra mind-control program?! How many times do we have to watch the very same choreographed drama play across the TV news screen? Are the American people so mesmerized by the CIA’s Mockingbird Media that they cannot see through these endless false flags and obvious hoaxes? Is the multi-decade mind-control programming being run on the American people also that powerful and pervasive? The nationwide opioid epidemic demonstrates that the body politic is taking way too many mind-numbing, body-desensitizing drugs, yes? The populace no longer possesses the presence of mind to discern between truth and falsehood. A vast majority of the people are unable to discriminate between what is real and what is fake. Bottom Line: The NWO globalist cabal knows that it’s just a matter of time. When there is a critical mass of citizens who finally demand the repeal of the Second Amendment for the sake of the children, the globalists have won. Remember, if they can put poisonous fluoride in our water for “the sake of preserving the children’s teeth”, how much of a leap is it to…. Unintended Benefit: There is a silver lining in this dark cloud hanging over the USA. With each subsequent false flag mass shooting, the American people are coming to realize that giving up their firearms would be an act of national suicide. How else to protect hearth and home against violent criminals (e.g. mass shooters) when local law enforcement is AWOL? How can anyone safeguard their families when even the FBI is always Out To Lunch? When the C.I.A. has been proven to be an exceptionally dangerous crime syndicate clearly Nobody’s Home where it concerns the security of the nation. How else to defend against the other alphabet soup agencies within the U.S. Federal Government when they show up uninvited to administer in-home vaccinations? Now do you see how the citizenry is slowly waking up to the absolute necessity of gun ownership? Of course, the sponsors of Operation Gladio C must not see this “unintended consequence” for them but benefit for US. As always at this early point of the investigation, it’s very difficult to label this MCE a hoax. Whether people really died or not is impossible to know for sure. However, the evidence will surely leak out which proves either this shooting to be a hoax staged with crisis actors, phony law enforcement officers, etc., or that good folks really died. In either case, SOTN expresses our deepest condolences to all the families who have been affected by this tragedy, real or fake.